It's been just crazy at work this past week, over 70 hours in the last 7 days. Oof. As a way to unwind after the loooong days I've been working on the new version of Thargadd's Thumpers that I'm painting up for Colonel Scipio of Palladian Guard fame! He recently posted some pictures of the build of the Palladian veterans that he's building and painting for me, and I am absolutely blown away with how cool they are looking. Check 'em out! In any case, I'm hoping I can get these guys finished up over the upcoming weekend, as it's supposed to be warm enough to get them sealed. We're in the midst of a Colorado winter here which means alternating days of snow and bitter cold followed by sunshiny, warm days. It keeps us on our toes, that's for sure! If you can't replace the original Thargadd's Thumpers, you could simply add more... the chant of every wargammer "I can always add more!" That Yellow-grey contrast is awesome! Was never much of a fan of these models, but you make them shine! @Dai - I was in the same camp when I first saw them when they were released a while back. Once I had them in-hand however they do have quite a bit of personality! I wish there was more variety to the available models, though - the way they are cut means that arms and bodies can't easily be swapped between them which is a shame. @Impcommander - Thanks, more to come soon! Wow, these are looking most impressive - looking forward to seing them in the (Ogryn) flesh! Wow. You now officially paint the best yellow ever! That patchy, worn blue looks amazing as well - these guys are amazing! I've put brush to model for the first few veterans, should have them done fairly soon! Really enjoying this. Well, I was until Headologist came up with that joke. Looking great mate - as said by the other lads - the yellow is very rich in depth. The 'new' Ogryns are a definite step up over the old ones. These painted up nicely, lovin' that middle guy! @Colonel Scipio & Rogue Pom: I'm glad you dig 'em! The yellow is really quite simple - I start out with a dark(ish) orange, followed by a light orange, and then golden yellow over that, being sure to leave some of the light orange showing in the nooks and crannies. The orange covers the black primer rather well, and it 'glows' through the yellow giving it a nice tone. I'll do up a little step-by-step on it soon! @Jugger: The sergeant model is probably my favorite as well! 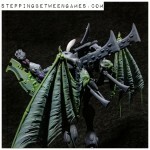 Is the one with the Ork Skull on the muzzle standard or is that a conversion? Cause I love it. Very atmospheric.